Tradition says that the light of the Hanukkah lamps is holy and cannot be used for any ordinary purpose. What makes the Hanukkah light holy? 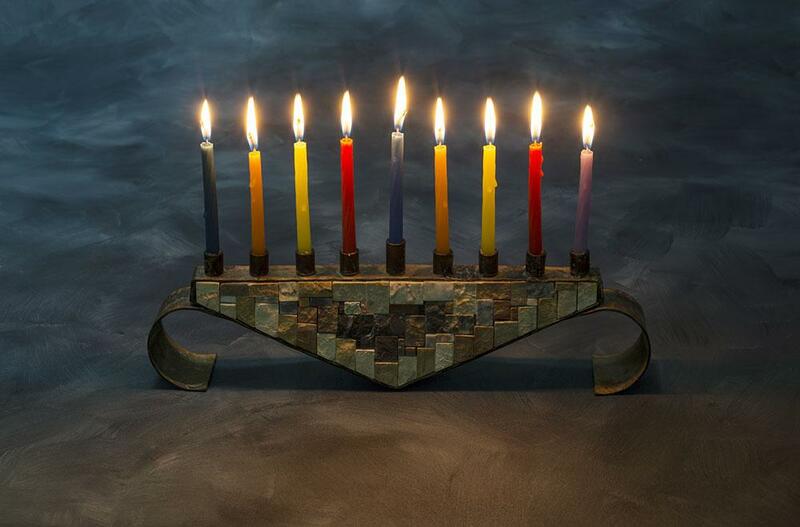 Why can’t you use the light of the Hanukkah menorah (chanukiah) to illumine your home? When you light a Hanukkah menorah, you aren’t supposed to use the light for any ordinary purpose at all. This seems counterintuitive. I would have assumed that the best way I could keep the spirit of Hanukkah would be to dim all the other lights in the house, light the chanukiah, and then sit beside it in the quiet, warm glow of the candles, using the light from the chanukiah to read the Scriptures or pray the Psalms. That sounds like a holy and appropriate use of the light of the Hanukkah menorah. On the contrary, the traditional rule states that one must not use the light for anything other than decoration. The chanukiah should be placed at the door, or in the window, so it can be seen from the outside, but it should not be used to illumine the inside of the house. It’s for decoration and for enjoyment, that is to say, it’s there just to look pretty. When the Hasmonean freedom fighters called the Maccabees drove the wicked Seleucids out of Jerusalem, they seized the Temple, threw down the idols, cleansed the Temple of the idolatrous filth, and dismantled the profaned altar. They built a new altar, a makeshift menorah, and then they lit the menorah, despite having only one day’s supply of oil. According to legend, the oil miraculously lasted for eight days. To commemorate the miracles of Hanukkah, we light eight lamps over eight days. On the first night, we light one. On the second, we light two. On the third, we light three…until on the eighth night, all eight lights are burning. The eight lights of the chanukiah proclaim the miracle of Hanukkah, and if we use their light for anything else, we are misusing them. This explains why it is important to have the shamash (servant) candle burning along with other eight lights. It’s a ninth light, and it isn’t holy like the other eight. It provides ordinary light that can be used for ordinary things. You aren’t even supposed to use the holy Hanukkah lights to light other Hanukkah lights. Instead, you use the shamash candle to do that. Why is the light of the eight lamps so holy? The light that comes from the eight lamps of the chanukiah is spiritually connected to the light of the menorah that burned in the Temple. The legend of the Hanukkah oil that lasted for eight days makes that connection obvious. One day’s supply of oil burned for eight days in the menorah, and the eight Hanukkah lights commemorate that miracle. They represent, therefore, the illumination of the menorah in the Temple, and that’s why their light is holy. 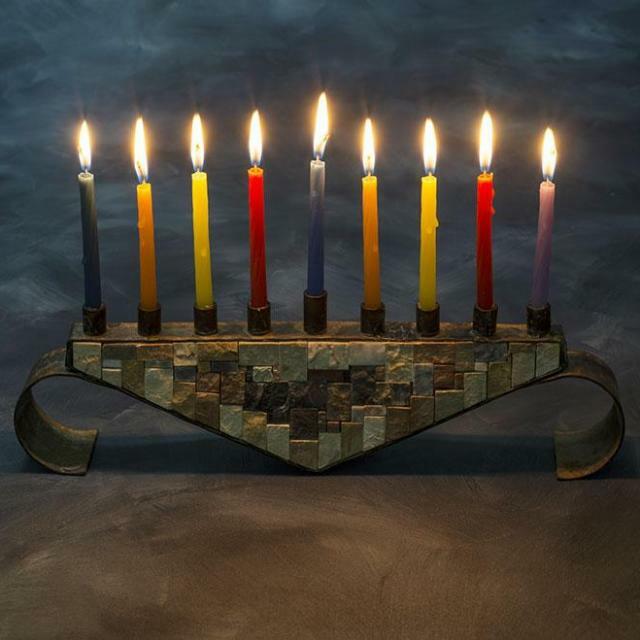 Jewish custom prohibits lighting and burning a seven-branched menorah because the seven-branched lamp is sacrosanct to the Temple. Likewise, the Torah prohibits us from making priestly garments and from weaving together the linen and wool mixture of the Tabernacle fabrics for our own personal use. It forbids us from using the Torah’s recipes for making incense and anointing oil for personal use. For the same reasons, we are not supposed to make a seven-branched menorah-lamp or candlestick. That’s God’s lamp, not ours. For all eight days of Hanukkah, these lights are holy. We are not permitted to use them for ordinary light but only to look at them in order to thank and praise your great name for your miracles, for your wonders, and for your salvations. It’s an amazing privilege to be able to bring the light of the Temple into our own homes. You might not be a kohen or a Levite, but by lighting the chanukiah, you get the privilege of performing a priestly function and bringing the light of the Temple into your home. That’s amazing. What an awesome privilege to be able to participate in the Festival of Hanukkah and to enjoy a little bit of the radiance of God’s house! After lighting the chanukiah, for half an hour afterwards, we should not be doing mundane things. It’s appropriate to sing Hanukkah songs, pray, read the Scriptures, and spend time in fellowship around the chanukiah, but we should not be doing ordinary things that would profane the moment. Instead, we should use that time to simply enjoy the holy light and the presence of HaShem while our chanukiahs burn and bring the light of kingdom into our homes.